The impact of the drum kit on the history of popular music is incalculable. From the end of the nineteenth century onward, Anglo-American popular music was accompanied more often than not by the sounds of the kick drum, snare drum, and cymbal. As these percussive elements coalesced into a single instrument – the drum kit – they provided the pulse of popular music from the earliest days of jazz through to the chart pop of the present day. This remains true while drummers themselves have historically been regarded as among the least important and lowest status members of a band (“What do you call someone who hangs around with musicians? A drummer”). This talk addresses a seeming contradiction – the ubiquity of the drum kit on the one hand, and the marginalization of drummers on the other – and makes the case for the drum kit’s place on the shortlist of the most important musical inventions of the last one hundred and fifty years. The argument here is that despite their low status, the drum kit and drummers had a more transformative impact on music than any other instrument from the nineteenth century to the present. 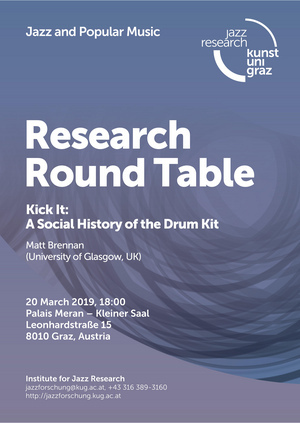 Tackling broader themes such as the drum kit’s role in the history of race relations, global migration, and the changing tension between high and low culture, the talk shines a light on the kit and how it changed music from the bottom up. Matt Brennan is a Reader in Popular Music at the University of Glasgow. He has served as Chair of the UK and Ireland branch of the International Association for the Study of Popular Music (IASPM), and has authored, co-authored, and edited several books in the field of popular music studies. His most recent book, When Genres Collide (Bloomsbury 2017), was named as one of Pitchfork’s “Favourite Music Books of 2017” and received an Honourable Mention at the Association of American Publishers’ 2018 PROSE Awards. Together with Simon Frith, he is co-editor of the Bloomsbury book series, Alternate Takes: Critical Responses to Popular Music.